For a lot of people, the Christmas pudding is part of the ritual of Christmas, the smell of it boiling away can take us right back to childhood. There is something so evocative of Christmas about the smell of citrus, so with this in mind, Rebecca created this gorgeous SIBO- friendly moist orange cake from the SIBO Chrismas eCookbook. While the oranges are boiling your house will truly smell of Christmas, and once it's turned out of its Bundt tin and decorated you will have a stunning centrepiece for Christmas Day. It's wonderfully simple but will truly look the part on this most special of occasions. We also think it would make a fantastic birthday cake too! Thanks to our lovely friends at Organic Angels for supplying the scrumptious organic produce featured in this recipe. Click here to find out more about how they could deliver beautiful organic produce to your door. Place four oranges in a large pot, cover with water and bring to the boil. Reduce heat and simmer for 2 hours. Keep an eye on the water level and top up as necessary. Drain, cool to room temperature, then puree the whole oranges in a blender or food processor until smooth. Pre-heat the oven to 160C/320F. Grease a 27cm/11-inch bundt cake pan with coconut oil. Beat the eggs and honey in a large bowl until well combined. Stir in the orange puree, followed by the almond meal and baking powder. Pour the batter into a prepared pan. Bake in the oven for 1 hour or until golden and skewer inserted comes out clean. Cool in the tin for 15 minutes then flip out onto a wire rack to cool completely. Thinly slice three oranges with a knife or a mandolin. Place slices in a large saucepan with the water, honey and vanilla bean. Bring to the boil, then reduce the heat and cook until the rinds have softened. Remove orange slices with a slotted spoon, reserving the syrup. Bring the syrup to a boil and cook until thickened. When ready to serve, place the cake on a large platter. Top with the orange slices and drizzle the syrup. Serve to the waiting crowd! Note: If you can't tolerate almond meal, you can substitute it with another nut meal. Macadamia nut meal would work just as well. What will you be serving as a dessert this Christmas? We love seeing your creations in the kitchen. Don't forget to tag us with #CookingForSIBO or #TheHealthyGut so we can find your photos and videos. And we always love to hear what you think of our recipes. If you enjoyed our SIBO friendly moist orange cake, let us know in the comments below. Want more SIBO Holiday recipes like this? Don’t feel deprived this holiday season! 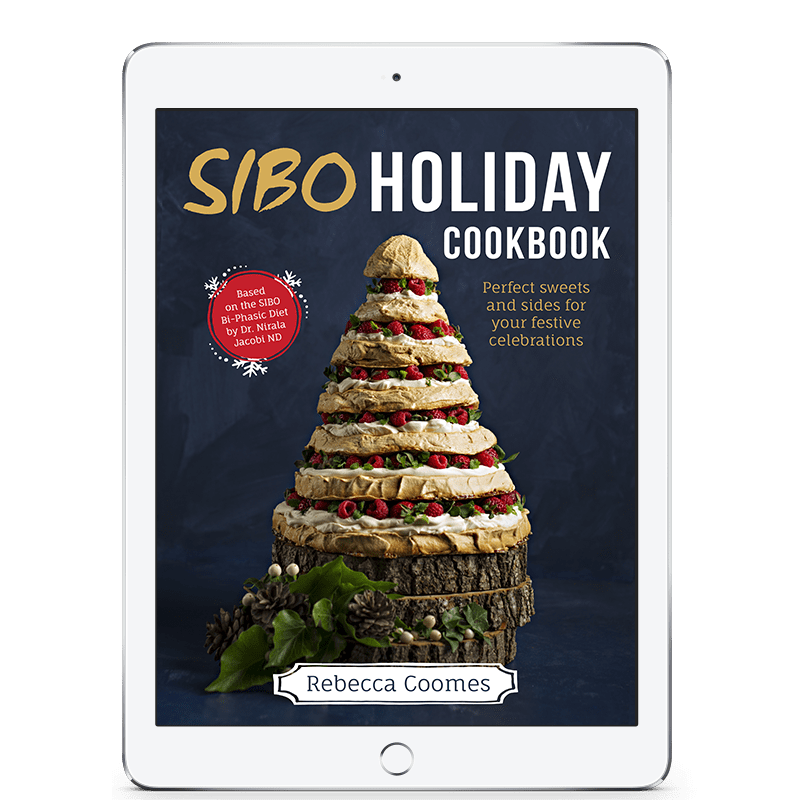 The SIBO Holiday eCookbook is bursting with SIBO-friendly appetisers, sides, desserts and sweet treats. All recipes are based on the SIBO Bi-Phasic Diet by Dr. Nirala Jacobi ND and clearly list what phase they are suitable for. Why not share the love? We love it when you tell your friends about The Healthy Gut Blog. Simply click one of the icons below to share it with your favourite social media platform. I am so excited to make the Orange Drizzle cake for christmas !! This is the perfect option for a gluten free Dessert/Pudding . Thankyou for yet again another mouth watering recipe. This looks delicious, but as im fructose intolerant could i substitute the honey for rice malt syrup or maple syrup? Yes of course. You can use any liquid sweetener that you can tolerate. Hi Christine, you could use another flour that you can tolerate if you can’t tolerate almond meal. It will change the consistency and you may need to alter the moisture content, but that would be how you could get around the almonds. This recipe looks lovely. Can’t wait to try it. One question though, will the recipe turn out fine, if I half all the ingredients and cook it the exact same? Hi Mia, the tin will be too large so you’ll need to use a smaller bundt tin. I haven’t tried it at half the quantity so I suspect you may also need to reduce the cooking time. Just keep an eye on it and make sure it’s not looking too dry. It’s quite a moist cake so you don’t want to dry it out. I am making this today for dinner tommorow. Can i put the oranges and syrup on today, or do i need to wait until just before serving? You could easily make up the orange syrup ahead of time and then just re-heat before pouring over the cake when you serve it. I hope you enjoy it! Tag us in a photo if you share it on Facebook or Instagram. Hi Rebecca! 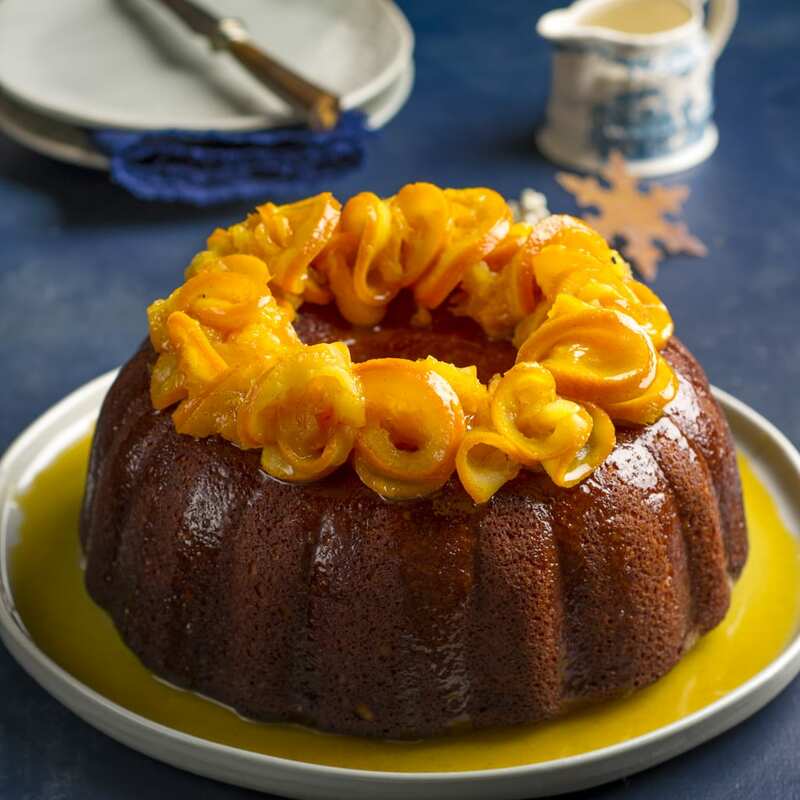 I’m making this beautiful dessert for Christmas, and I have a silly question regarding the 4 oranges I use for the cake. Do I put the whole orange including the rind into the boiling water? I just want to make sure I’m doing this right. Thank you! Yes! They go in whole, pips and all. It seems a bit weird, I know, but the end result is a lovely rich cake. And it’s not bitter at all. The cooking of the whole oranges takes away the bitterness. If you take a pic of your cake, I’d love to see it. Make sure you tag me in Instagram or Facebook so I can see it, or use #CookingForSIBO so I can find it.